Fortune favors the bold – or does it? 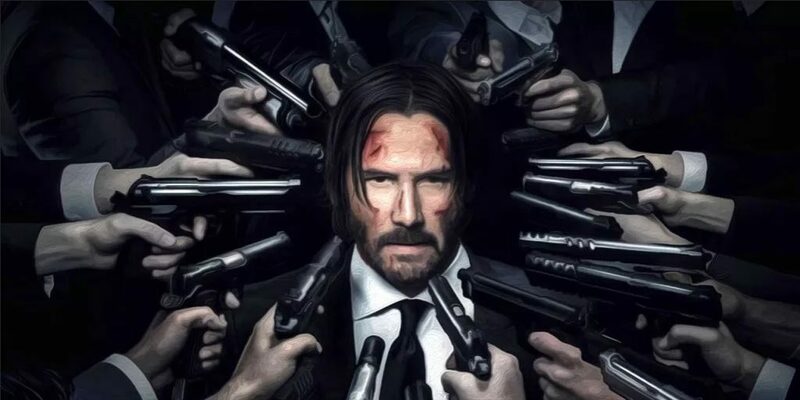 As we await the release of John Wick: Chapter 3 – Parabellum, to be released in May 2019,the previous film of the neo-noir saga left us with a lot unanswered questions. What will happen to Keanu Reeves’ character now that every skilled assassin in the world is out to get him and he doesn’t have the safety of the Continental? Will leaving Cassian alive come back to bite him, or will it help him later on? And will John save his own life by destroying the very community he’s a part of? But one of the most-asked questions on the internet has nothing to do about John Wick’s life on the line, but on his back tattoo. When fandoms, movies, and popular characters are inspiring more people to get a tattoo, the cryptic tattoo of one of the most feared assassins is something both men and women might want to get. But upon checking historical Latin examples and uses, while there are various ways of saying fortune favors the bold, John Wick’s tattoo isn’t one of them. So, it may be similar in the way that they both talk about fortune, but it’s not the same message. We explore what John Wick’s tattoo really means. There are various wordings of the Latin phrase for “fortune favors the bold,” but the most common is audentis Fortuna iuvat. We can trace this back to Virgil’s Aeneid, used by the King of the Rutuli, Turnus. In this case, “Fortuna” can both refer to fortune, or its Roman personification, Fortuna, the Roman goddess. Fortuna is the Roman goddess that serves as the personification of luck. When poets invoke her name or when Romans call for her favor, they’re praying for good luck and hoping to avoid the bad luck she brings when they incur her wrath. Because she controls fate, she was also said to have a hand on who is successful and lives, and who isn’t. Let’s break down the Latin phrase audentis Fortuna iuvat. Audentis is the singular genitive form of audens, which means someone daring, bold, and eager for battle. Fortuna, as we’ve already established, is the goddess that symbolizes fortune. Iuvat, in this phrase, acts as something of a verb which means to save, aid, gratify, or delight. In other words, in order for someone to achieve fortune and success, they have to be willing enough to fight for it. It’s an aggressive idea, but one that has been used many times in armies, navies, and other military groups around the world. Now that we know what Fortuna means, let’s break down the two other words in his tattoo: fortis and adiuvat. Instead of audentis, John Wick’s back tattoo says fortis, which means strong, courageous, or brave. Some may argue that it’s not that different from audens, as one who is bold must also be strong. But in terms of grammar, audentis is the neutral singular form while fortis is a neutral plural noun. So, while the former refers to a daring one, John Wick’s tattoo refers to a plural group of brave ones. And in terms of vocabulary, it can be argued that bold is different from strong. While both can mean a courageous person who would do something an average person would choose not to do, both have different connotations. The word “bold” can be positive, but it is also linked to someone who is rash, brazen, or offensive. You don’t have to be strong to be offensive. Being “strong,” however is someone who isn’t afraid and will act upon what they believe, whether by physical means or any way possible. Adiuvat has the same root word as the other phrase, iuvat. The ad- is actually a prefix, with means to towards a certain direction. Added with the meaning of iuvat, which means save or aid, the word adiuvat does not mean to favor, but rather “to come and aid” or “to come and save.” Favor may be a good synonym for iuvat, but not for adiuvat. In fact, according to Latin poetry translator Benjamin Griffin, the translation we know today as “fortune favors the bold” may have used “favors” because of poetic license which, although rings off the tongue and sounds catchy, is not a hundred percent accurate. It’s a bit similar to “fortune favors the bold,” but if you look at it in terms of the John Wick movies, you can see that the films favor the other translation. Sure it may just be a reference to his time in the Marines as the John Wick videogames later indicate, but if you look at a bigger picture, it really reflects about the fates of some major characters. Iosef Tarasov, who impulsively decides to beat up John Wick, steal his car, and kill his dog, is bold. But as the first movie – as well as Aurelio and Viggo’s reaction – show, they did not appreciate Iosef’s brash decision. In fact, his actions have earned him the total opposite of fortune, and it’s his decision to pursue the matter of John’s car that ultimately leads to his death. On the other hand, if you look at John’s actions in the same movie, you would say that he’s more strong and brave than he is bold. His dog’s death probably shook him and everyone else watching the movie. John’s act for revenge for the murder of his dog showed that he had only one goal. He wasn’t rash about anything: he was smart, he took his time, he persevered and handled anything that stopped him from his goal. And ultimately, he was successful. He was more strong and brave than he was rash, and as a result, he was more fortunate than, say, the entire bold and rash Russian Mafia. We also see this play out in the second movie, where being bold doesn’t really earn you any favors. This time, it’s John who exhibits the loss of fortune. Choosing to break one of two of their community’s rules and killing Santino inside the Continental, John is now in a difficult position as every highly skilled assassin who wants $14 million is now out to get him. It was frustrating for Santino to have escaped his clutches, but had John chosen to be strong and learn from what happened to Ms. Perkins in the last film, he wouldn’t have been in the situation he’s in come the third movie. So, who was the strong one Fortuna favored in the movie if it wasn’t John? Well, it’s Cassian. Cassian was only doing his job when he sought revenge for Gianna’s death. But if you remember that tense scene where he was forced to stop trying to kill John and share a drink in the Continental. Like John in the first movie, he played by the rules and waited. It’s probably one of the reasons why John had so much professional respect for him – because he, too, showed strength and courage that John showed. And not only does this tattoo reflect so much on the first two films; its true meaning may also have an effect on the upcoming film. This is all just speculation about what the third movie holds (feel free to share your thoughts or theories in the comments! ), so take these with a grain of salt. While deconstructing the true meaning of John Wick’s tattoo, I realized three important implications the message on his tattoo could have on the third movie. The trailers, teasers, and poster for John Wick: Chapter 3 – Parabellum hints that John Wick, now with a $14 million hit on him, must escape an entire organization of assassins. This time, however, he doesn’t have the safety of the Continental, which had already saved him at least once in the last two movies. The first implication now is that John is now a wiser assassin. He was once a brave assassin, but his decision to choose to kill Santino has led to his downfall. There’s not much to say about this except he may be more careful about which step he makes, but more on this later. Second, Winston’s action was brave. As I mentioned at the beginning of this article, what if one of the ways John Wick can ever truly be safe again is if he killed the High Table and, as a result, destroy the organization of hitmen and create an every man for himself sort of world? Or, even worse, what if he tried to kill everyone? He’s done it before, so chances are he’ll do it again. However, that may mean killing everyone in the crime underworld, including the staff members of the Continental. Will fortune favor Winston, who spared John Wick’s life for a moment by giving him a marker and giving him an hour’s head start? By the laws of Chekhov’s gun, that marker will be used one day. But what if the act of giving John a marker becomes what eventually saves Winston’s life? Third, note how the Latin says “the strong ones.” The Latin is in plural. If John Wick made this tattoo for himself, it’s worded incorrectly because he’s just one man. So, what if this means the tattoo wasn’t limited to just John Wick himself, but to every assassin in the John Wick universe? What if that was the way an assassin initiates themselves into the network of hitmen, and they all played with the same rule that the strong ones are the ones favored with fortune? This is what brings me back to my first implication. If everyone (or at least the hitmen in the same league as John Wick’s skill) had the same tattoo, what if a hitman’s downfall – choosing to be rash and bold rather than strong and brave – is what eventually leads to their downfall. Iosef is dead, Viggo is dead, Marcus, Santino, Ms. Perkins and anyone who acted rashly without a care for the rules or the consequences are now dead. What if, because of John’s decision to kill Santino, he’s sealed his fate? First, it means that I’ve spoiled the ending for myself. Second, it means that no matter how much John Wick fights to get out of New York City, eventually, he will meet his downfall. Then, it may mean that the entire film revolves around characters’ hamartia – their fatal flaw that leads to their downfall. And in a film series piled with corpses, it’s not hard to think that each character has at least one fatal flaw. This is just speculation and I may just be making a big deal out of a back tattoo. But notice how that tattoo was the focus for 10 seconds while John Wick was taking a shower in the first movie. When movies are trying to keep things short to fill in more story, the fact that it got so much screen time means that it is important – possibly a recurring theme in the film? And notice the third film’s name, “parabellum.” It’s Latin, from the Latin phrase “Si vis pacem, para bellum,” or “If you want peace, prepare for war.” It’s saying that, in Chapter 3, John needs to prepare for war. And, as history of wars has shown, if you want to win, you’ve got to have brave and strong soldiers, not bold soldiers.